Roast the Sweet Potatoes and Brussels Sprouts: Preheat the oven to 400ºF. Toss the sweet potato with 3 tablespoon olive oil and a sprinkle of salt (optional). Spread them out in a single layer on a low-sided roasting pan. Toss the brussels sprouts with 3 tablespoons olive oil and a sprinkle of salt (optional). Spread them out, cut side down, in a single layer on a low-sided roasting pan. Roast the two trays of vegetables, undisturbed, for 25-30 minutes or until they are tender and starting to brown. The sweet potatoes may need 5 more minutes in the oven than the brussels. Cook the quinoa: While the veggies are roasting cook the quinoa per package instructions (1 cup quinoa with 2 cups water for about 14 minutes). While the quinoa is cooking put the sliced kale into a large bowl. When the quinoa is ready, immediately add the hot quinoa to the bowl with the kale and toss to combine. The kale will soften and cook a bit from the heat of the quinoa. Set aside. Make the Vegan Lemon Parmesan Dressing: Using food processor or blender, finely chop the toasted pecans. Add the nutritional yeast, salt and 1 tablespoons of olive oil and pulse to combine. In a separate small bowl whisk the remaining 4 tablespoons of olive oil with the lemon juice, dijon, salt and pepper. Pour the mixture over the kale-quinoa and toss to combine. Sprinkle the pecan parmesan on top just before serving, and toss. Assemble the Buddha Bowls: Divide the quinoa/kale mixture between 4-5 bowls. 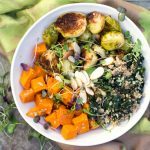 Divide the sweet potatoes and brussels sprouts between the bowls, each in their own pile so you can see all the wonderful colors and textures. Sprinkle garnishes on top: cranberries, almonds, micro-greens or all three. Season, to taste, with salt and pepper.